Leftovers, in some ways, are not very Japanese. It's often about fresh food made on the spot, and often right in front of the diner just after they order. This post, though, covers the first trickle of a new trend: doggy bags. It first appeared at Greenz on October 20th, 2010. Eco-conscious diners and locavores now have a solution for their restaurant leftovers. Reusable food boxes make it possible to have a clean plate without over-stuffing yourself. Reliable companions for reusable chopsticks, "doggy boxes" cut down on food waste as well as ensure something tasty for tomorrow's bento. Ranging in size and shape, Doggy Bag Flats come two or three in a package in varied designs. Available in trendy colors and patterns (one even by Benetton! ), the boxes simplify (and beautify) the idea of toting home a few treats. 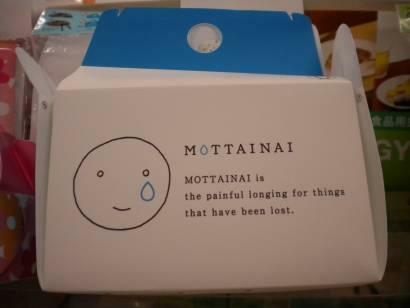 Customers can also choose more potent messages - boxes with Mottainai defined or basic statistics about food waste in japan - to make it easy to let other diners know why they're tucking away those last bits on their plates. Creators of this eco-concept in Japan, the Doggy Bag Committee, see it as an effective means of reducing Japan's food waste (equal to roughly the same amount as the country's food aid or five to nine million tons) destined to become animal feed, fertilizer, or incinerator fuel. Endorsed by Food Action Nipon, these washable, reusable, educational (and rather adorable) containers are made from one sheet of paper to stave off leaks and are themselves biodegradable. Brilliant if you ask me. This is brilliant- I'm just surprised there would be any food to take home- when I lived in Japan the portions were just a very nice size for one person- have they increased the portion sizes? Well, as a friend pointed out on Facebook, the leftovers from parties are rather hefty. Most people bring some kind of container from home, and these are sort of a cute way to fit that bill. Cute is all the rage in Japan. I think, too, the doggy bags probably raise awareness of food waste, too, although I must admit it would be better to start with the restaurants and food shops that pitch so much food at the end of the day.